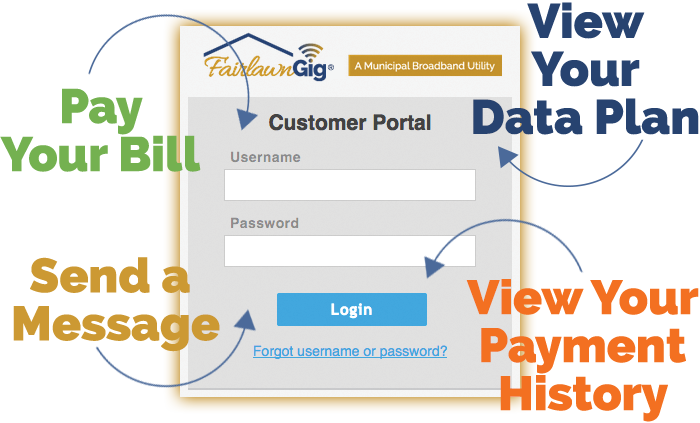 FairlawnGig’s billing system for residential and business customers has everything you need to manage your account is in one place: the FairlawnGig customer portal. FairlawnGig customers can add payment methods, such as e-checks or credit and debit cards to pay their bill online through the portal. Our secure system protects your information and allows you to pay your bill, view past statements and change payment methods online through the FairlawnGig Customer Portal. You can set up your payment preferences and pay online through a secure payment gateway. Pay by using a checking or savings account e-check, credit card, or debit card. 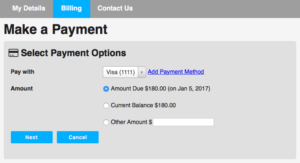 With just a couple of clicks, you can make a one-time payment directly in the customer portal using your chosen payment methods. Automatic payments are also possible; each month, the payment for the current bill will be withdrawn from your bank account or charged to your credit card on the due date. You can also pay by check in person at the FairlawnGig office or mail a check. But we think you’ll find that using our online system is both efficient and easy. Customers can add or change contact information and view past statements. Do you have a question for us? FairlawnGig customers can send us an email through the portal and we’ll reply promptly. You can also call us if your needs are more complex. No navigation of complex phone systems; a customer service representative can be reached directly at 330-668-3300. Because FairlawnGig is managed locally, you can also visit our office in person. 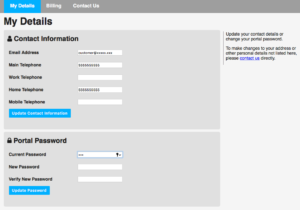 New FairlawnGig customers will be sent more details about our billing system. You can read more about billing on our website’s policy page. Customers with questions about their service can click on the Contact Us button to email FairlawnGig directly through the billing portal. If you’re not a FairlawnGig customer yet, you can sign up for service here.